President Obama's powers of spin will be sorely tested in the coming weeks as he tries to sustain the appearance of progress in his efforts to restart an Israeli-Palestinian peace process. The latest setback came on Tuesday, when Egypt's President, Hosni Mubarak, canceled a planned meeting with Israeli Prime Minister Benjamin Netanyahu. Some reports, denied by the Egyptian government, said Mubarak would fly to Germany for medical treatment. Israeli media have speculated in recent weeks that Mubarak is suffering from cancer. 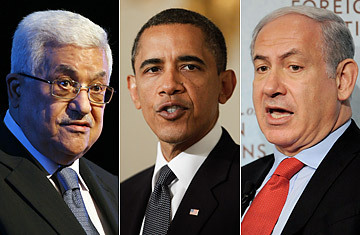 Obama and Netanyahu had been hoping that Mubarak would endorse the U.S. call for direct peace talks between Israeli and Palestinian leaders and persuade Palestinian Authority President Mahmoud Abbas to do the same. But a Mubarak illness and its implications would distract the region, making the already slim chances of winning Arab backing for direct talks even more remote. Until now, Abbas has needed the political cover of support by Mubarak and other Arab League governments for participating even in the indirect talks orchestrated by the Obama Administration. That's because Abbas' political status among his own people has been steadily weakened over two decades of fruitless negotiations with Israel, during which the Israeli occupation of the West Bank has broadened and deepened. Arab League Secretary General Amr Moussa, who is Egyptian, said last week that the indirect talks had been a "failure" and that there was no point in proceeding to direct talks. Abbas and his Arab backers had agreed to suspend their skepticism and join indirect talks, if only to demonstrate to the Americans the basis for their belief that Netanyahu has no intention of implementing a credible two-state solution. They argue that their point has been proven by the course of the indirect talks. The Arab League endorsed indirect talks but only until September, and it is meeting at the end of July to assess any progress. Netanyahu had scheduled the expiration of his temporary and partial moratorium on West Bank settlement construction for September. But the Palestinians set little store by an Israeli moratorium that allowed for continued construction in occupied East Jerusalem, and the approval on Tuesday of new Israeli housing units in that part of the city will be cited as further reason to stay away from direct talks. Even if Netanyahu had any serious intention of moving against the hard-line settlers who claim a biblical duty to colonize the West Bank, the scale of the challenge he would face is underscored by last week's report by an Israeli human-rights group demonstrating that the settlers are in control of 42% of West Bank land. The settlers are strongly represented within Netanyahu's government, and also within the military, and there's growing skepticism on both sides that this  or any other  Israeli government will take the politically explosive step of evacuating tens of thousands of settlers. Instead, Netanyahu hopes to coax the Palestinians back to the table by announcing, in the coming weeks, gestures such as removing some checkpoints, restoring Palestinian Authority security control in some West Bank cities and allowing the Palestinians to build a road to a new planned city. Even in Israel, the left-of-center paper Haaretz wondered whether Netanyahu is trying to resolve the conflict, or else simply seeking "to portray the Palestinians as the ones refusing peace." Abbas clearly fears a trap similar to the one Palestinian leaders believe was laid for Yasser Arafat in 2000. Prime Minister Ehud Barak, now Netanyahu's Defense Minister, said after the failure of that year's Camp David talks that his real purpose in pushing for the summit, despite ample evidence beforehand that it would fail, was to "reveal Arafat's true face." In other words, to ensure that the Palestinian side was blamed for the failure to conclude the Oslo peace process, thus removing any pressure on the Israelis to end the occupation. With both sides believing that they're unlikely to agree on a credible and comprehensive two-state deal despite the U.S. desire to settle the conflict, the game is once again for each to cast blame on the other. But with the White House's attention now on a difficult November congressional election  a focus that always works to Israel's advantage, given the far greater domestic political leverage its advocates wield in Washington  the Administration isn't likely to expend political capital on the issue anytime soon. Observers on both sides in the Middle East concurred that last week's embrace of Netanyahu by Obama was a domestically driven vindication of the Israeli leader's defiance of Obama's earlier efforts to pressure Israel on the settlements issue. Even if the Obama Administration manages to coax Abbas into direct talks, the likelihood of them producing any kind of agreement is slim. The gulf between the two sides' positions is not a matter of personal chemistry but of political reality. The standoff seems to underscore the idea that Israel and the Palestinians are unlikely for the foreseeable future to reach an agreement simply through dialogue that settles the core final-status issue of the two-state solution. But those hoping that recognition of that reality might prompt the U.S. to seek an international consensus on a final-status agreement that both sides could be pressed to accept are forgetting that the 2010 electoral season  followed by the 2012 presidential race  militates against the Administration's trying anything quite so bold in the Middle East. There may be a political logic to Obama's two predecessors' leaving their Mideast peacemaking efforts to their eighth year in office. See TIME's Middle East covers.